What if Alice Paul (who fought for women’s rights), or Rosa Parks, or Dr. Martin Luther King, Jr., or Nelson Mandela, or Mahatma Gandhi said the same? Or countless others who had no positional authority but decided to lead anyway? Each of us is a leader already with or without formal authority. We lead in our relationships with others: our friends, family, nonprofits, or in our professional lives. The leadership might be as simple as saying, “I don’t think we should do that” or “Why don’t we try … .” Those are leadership actions. Each of us has powerful leadership capabilities latent within us. We may choose to follow most of the time, but we can unleash that latent leadership with some common sense practices. Start with yourself, answering the question of “Why do I want to lead?” Is it for power, control, to get back at them? Not good reasons. Leadership is all about serving others, helping them to get to a better place. Then reexamine your mindset about leadership. Is your self-talk negative and disempowering? Do you believe leaders are born and not made? (See our response.) Do you believe that leaders must be brilliant, heroic, or charismatic visionaries? Are you cynical and sarcastic? Few people follow negative-nellies. Be more proactive about confronting your limiting beliefs and behaviors. Finally, set realistic expectations for your leadership. Be patient, and start with small steps to build momentum. Business, life, and leadership are all about relationships. To unleash your latent leader, you can utilize numerous practices. Up your emotional intelligence, focusing on your self-awareness, social awareness, self-management, and relationship management. See Daniel Goleman’s book, Emotional Intelligence, for a good primer on the subject. 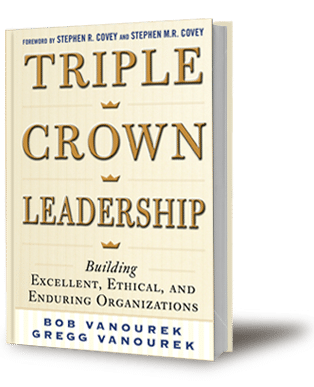 Healthy relationships are built on trust between people, not distrust, nor naïve trust, but “Smart Trust,” as proffered in Stephen M. R. Covey’s great book. Smart trust involves trusting people a reasonable amount and then building higher or lower levels of trust based on your experience and open discussions of trust with them. High-performance teams invariable rely on shared values to guide their behavior. See our previous blog on this topic: “High Performance Begins with Shared Values.” To lead well, you should collaboratively develop shared values with your colleagues. Flex your leadership approach between the hard and soft edges of leadership, what we call “steel and velvet.” Steel is exercising your authority, position, and power, which you must do at times. But steel-only leadership fails. More often, you should be velvet: listening, asking questions, letting others lead, and coaching others along the way. Be present when you are with people, not multi-tasking. Maintain eye contact, actively listen, show empathy and understanding, and acknowledge their point of view, even if you disagree. Only then can you make connections of trust that build healthy relationships. Finally, you need to practice. Leadership is best learned experientially, by trial and error, by leading small projects, then larger ones, especially with an experienced leader providing feedback and coaching. Volunteer to lead something, anything. Then do it again. Core Concept: Everyone has the capacity to lead at times, starting with leading yourself first and then building relationships.